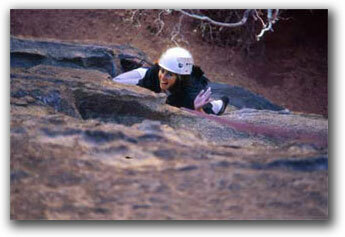 Four day rock climbing courses are offered on selected Saturday thru Tuesday time frames. Accelerate your learning curve with four consecutive days of rock climbing instruction and technical skills. For the energetic beginner we have combined our two day Basic Rock Climbing Instruction Weekend and our two day Intermediate Rock Climbing Instruction Weekend to form the"4 Day Beginning Rock Climbing Seminar". Our low student-to-instructor ratio guarantees plenty of hands-on practice and individual attention. Jump start your climbing adventure! Our "4 Day Intermediate Rock Climbing Seminar" begins with the two day Intermediate Rock Climbing Instruction Weekend and continues with the two day Leading Skills. Trip size is limited, so plan ahead. Cost: $995 To make your reservation, Click Here! complete and submit. You will receive a confirmation by Email within 48 hours. 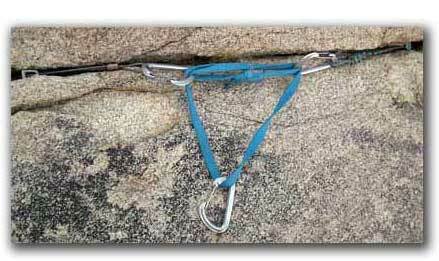 (Cost includes use of all rock climbing gear and climbing instruction). As you will see your guide works very hard and is extremely skilled and gratuities for your guide are customarily 15-20% when you are pleased with their performance. Prices are based on a minimum of two participants. In the event particpant minimums are not met, options include; rescheduling, receiving full refund or converting class into "Private Guiding" and paying private guiding rates. Cost: $995 (Cost includes all rock climbing gear and climbing instruction). Prices are based on a minimum of two participants. In the event that course participant minimums are not met, options include; rescheduling, receiving full refund or converting class into "Private Guiding" and paying private guiding rates. To Make a reservation, click on the "Reservation Form" button found on the bottom left hand corner of any of our website pages. Complete the reservation form and then click the submit button at the bottom of that page. You will receive a confirmation letter by way of e-mail within 48 hours. The weather varies greatly throughout the day and season. 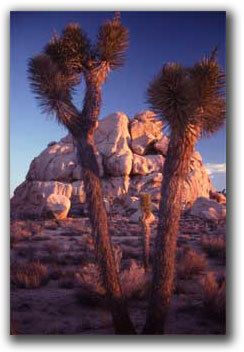 The high desert elevations range between 3000 and 5800 feet above sea level. These high desert temperatures are generally 15 to 25 degrees cooler than the nearby low desert Palm Springs, California. Remember to bring lunch, snacks, plenty of water, clothing appropriate for time of year, hat, cap, sunglasses, sunscreen, personal items, (optional) camera for the memories and a daypack to keep the items together.